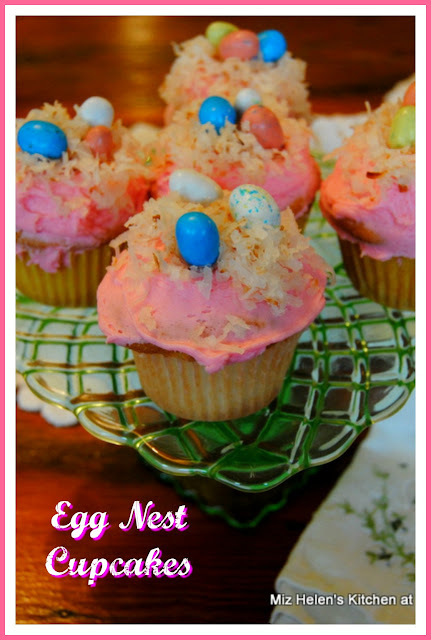 Egg Nest Cupcakes can be a very special little treat for any Easter function, brunch, lunch or a special Easter Egg Hunt. These are very simple but delicious cupcakes with a delicious buttercream frosting. We are topping them with some toasted coconut and having fun hiding little candy Easter eggs in the coconut. The kids will have fun helping you decorate the cupcakes and they are so good! A really good thing about these cupcakes, they can be frozen until time to use, a great make ahead treat! In a mixing bowl cream the sugar and butter together, until light and fluffy. Add the eggs one at a time beating in between. Mix in the extract. In a mixing pitcher, mix the flour, baking powder and salt. Alternate the dry ingredients and the half and half into the sugar and butter, mixing until smooth. If the batter is to stiff, add more half and half. Place cupcake liners into the cupcake tins. Using a half cup scoop, fill the cupcake liners 3/4 full. Bake at 350 degrees for 18 to 20 minutes, or until golden brown on top. Add the confectioners sugar a little at a time. Add the vanilla and half and half until desired consistency is reached. Add more sugar or half and half if you need to. Add the tint color at this time if you are tinting the frosting. Make sure your cupcakes are completely cooled before you frost them. Any kind of sprinkles, jelly beans or little candy Easter Eggs. I am so happy you could stop by today and have one of these special little treats that we made for you. We always look forward to your visits and hope you will come back to see us real soon! What pretty cupcakes! They would make such a cute addition to our Easter dessert table.